Carter Kieboom does not have any MLB stats for the season. Draft: 2016, Washington Nationals, 1st rd. Carter Alswinn Kieboom...Attended Walton High School in Marietta, Ga...Was considered one of the best prep hitters in the 2016 First-Year Player Draft...Collected numerous prep All-America honors, including being named a 2016 Rawlings/Perfect Game preseason first-team All-American, 2016 Louisville Slugger first-team preseason All-American by Collegiate Baseball and the 2015 Under Armour All-American Game MVP...Also saw time on the mound for Walton as an ambidextrous pitcher...Led Walton to its first state title in 2016, as the school claimed the Georgia Class 6A championship...Signed a National Letter of Intent to play baseball at Clemson (SC) University but chose to sign with Washington...Brother of Nationals catcher Spencer Kieboom... Pronounced KEY-boom. Washington's Minor League Player of the Year...Hit .280 with 31 doubles, one triple, 16 homers, 69 RBI, 58 walks, nine stolen bases and 84 runs scored in 123 games between Single-A Potomac and Double-A Harrisburg...Was the second-youngest player in the Eastern League in 2018...He ranked in Washington's system in runs scored (1st, 84), doubles (2nd, 31), RBI (2nd, 69), hits (3rd, 138), home runs (3rd, 16), walks (3rd, 58), slugging percentage (4th, .444) and OPS (4th, 801)...At the time of his promotion to Harrisburg on June 21, he ranked among Carolina League hitters in home runs (T3rd, 11), RBI (3rd, 46), hits (3rd, 73) and batting average (7th, .298)...Was selected to represent the Nationals in the 2018 SiriusXM All-Star Futures Game...After joining the Senators, he hit .362 (25-for-69) with five doubles, two homers, seven RBI, six walks and 12 runs scored in his first 17 games in the Eastern League...He finished the season rated as the No. 34 prospect in all of baseball according to MLBPipeline.com and the No. 45 prospect according to Baseball America...MLBPipeline.com named him Washington's Organization Prospect of the Year and an Organization All-Star... Baseball America also cited him as the No. 5 prospect in the Eastern League following the season...Hit .295 (23- for-78) with one double, one triple, one homer, five RBI, 17 walks and 18 runs scored in 21 games for the Salt River Rafters of the Arizona Fall League. April 2, 2019 SS Carter Kieboom assigned to Fresno Grizzlies from Harrisburg Senators. 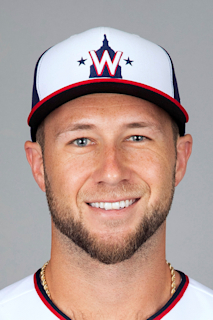 February 12, 2019 Washington Nationals invited non-roster SS Carter Kieboom to spring training. June 21, 2018 SS Carter Kieboom assigned to Harrisburg Senators from Potomac Nationals. April 4, 2018 SS Carter Kieboom assigned to Potomac Nationals from Hagerstown Suns. March 2, 2018 IF Carter Kieboom assigned to Washington Nationals. August 15, 2017 SS Carter Kieboom assigned to Hagerstown Suns from Auburn Doubledays. August 6, 2017 Hagerstown Suns sent SS Carter Kieboom on a rehab assignment to Auburn Doubledays. July 28, 2017 Hagerstown Suns sent 2B Carter Kieboom on a rehab assignment to GCL Nationals. May 13, 2017 Hagerstown Suns placed SS Carter Kieboom on the 7-day disabled list. April 4, 2017 SS Carter Kieboom assigned to Hagerstown Suns from GCL Nationals. June 24, 2016 SS Carter Kieboom assigned to GCL Nationals. June 16, 2016 Washington Nationals signed SS Carter Kieboom.